Cover Description: A restrained Trixie looks on as Booster lies on the floor in some 25th-century version of "the rack" torture device while Broderick stands on his back and proclaims judgment against him. Brief Synopsis: Stranded and sentenced to death in the future, Booster and his friends fight to find a way to escape captivity and return to the 20th century. In a news broadcast regarding the imminent execution of 25th-century "former football hero" Booster Carter, Booster is oddly pictured wearing his 20th-century super-hero costume, complete with collar and goggles. The female newscaster reminds us that only 4 shopping days remain until Christmas. Some things will never change. After Jack punches a cop in the helmet, Rip brags that he is both a scientist and a fighter, a boast proven true during many tight spots in his own silver age title, Rip Hunter... Time Master. Since the events of last issue, by court order Booster has been cured of his disease (a mutated bacterial infection), and his broken bones have all been mended. This is a convenient, off-panel solution to the developments that forced Booster back into the future. Broderick declares that Booster Gold's theft of a time machine makes him a terrorist. "The consequences of that action could negatively affect every person on this planet and time itself!" While that may be true, a time machine is hardly an effective weapon of terror: changing history will re-write the present, and no one would be the wiser. Ignorance of a crime is not a very good method for inspiring fear in the survivors. Jack and Rip visit 25th-century S.T.A.R. 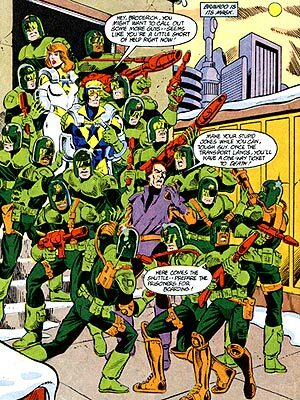 Labs while disguised as 25th-century policemen. The success of S.T.A.R. Labs is so great, that it will survive a nuclear war and exist in Booster's native time. Jack and Skeets uncover the information that in the Post-Crisis on Infinite Earths DC Universe, each person can travel through time only once by any known method due to the extreme stress on the human body. Jack theorizes that this means that the Time Sphere that Booster originally traveled from the 25th to 20th centuries as powered by a different means than the recently destroyed "Tachyon Tracing Process" Time Sphere that took him from the 20th to the 25th centuries. Using technology stolen from S.T.A.R. Labs, Jack is able to fully recharge Booster's costume. Presumably, Jack has also either stolen enough battery packs to power Booster's armor well into the future, or he has learned enough to recreate them in the past. 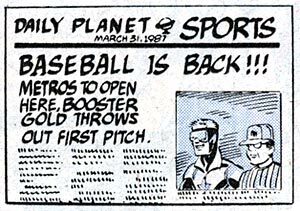 EXTRA, EXTRA: Trixie reveals a historical tape that proves that Booster will return to the past: a Daily Planet newspaper Sports page dated March 31, 1987 with Booster Gold preparing to throw the first pitch for the Metropolis Metros baseball team. Booster and company departed Metropolis in the year 1986. Booster refers to himself as the "Corporate Crusader." This is a pun on Booster's oft-mentioned idol Batman's longstanding moniker as the "Caped Crusader." Believing himself to be trapped in the future by Broderick's stray blaster bolt, Booster knowingly prepares to sacrifice himself to transport his friends home to the 20th century. This is not the first truly selfless act that Booster has intended, but it is the sort of action that Booster rarely gets credit for. SILVER SCREEN: Booster comments that a major motivation for returning to the 20th century is the Booster Gold movie. Boosterrific Review: Just to get it out of the way: the lowlight of this issue is the resolution to the "Booster's dying" storyline that ended as suddenly and inauspiciously as it began two issues ago. Boy, do I hate transparent plot devices used to force people to travel through time. 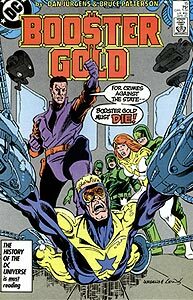 Better than the previous issue, this comic sees Booster Gold struggling to avoid his execution, reunited with his family, and learning a lesson in the end. It is fun and touching without being preaching or heavy-handed. Overcoming the previous issue's faults, this is a satisfying conclusion to the current story arc and a fine addition to the series. Boosterrific's writing of Page 9 in his annotations is hilariously spot on, right down to the coincidental (and humorous) Mr. Miracle promo. I also agree that the answer to his problems was like an afterthought, but I wasn't really expecting anything dramatically bad to come of it to begin with. This conclusion seems a bit rushed and-oh no-the dreaded bathos of the face in the clouds as Trixie memorializes a fallen comrade.